We are an event planning company, but we are very niche: we run games. Typically, ~2 hours, including intro, playing the game, and awards ceremony. We have programs that can fit a timeframe from 30 minutes – 4 hours. Almost all can be modified to fit in the window of time that you have available in your agenda. So what do you get for the price? Planning. Our experienced production team will liaison with you to take in all the details and give you total peace of mind. On the day of the event, you can rest assured that everything will be taken care of. All you will have to do is show up. Everyone will have a great time, you will actually get to participate in the event, and you’ll look like a genius for choosing us. Personnel. 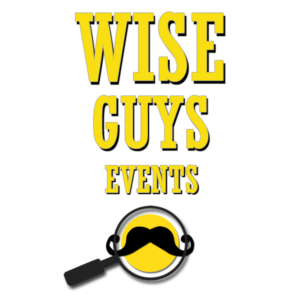 You’ll have a Wise Guys MC on site, supported by a team of our expert game masters, to make sure everyone is safe, comfortable, and having a good time. Clients regularly tell us that interacting with our staff is one of the highlights of their event. Props. If you need it to play the game, we provide it. That’s everything from hula hoops, jelly beans, bubble wands, chicken hats, and scorecards, all the way down to scratch paper and pencils to figure out the answers to our puzzles. Prizes. Gag gifts are included for the top teams, so there’s no need for you to furnish anything. Pictures. After the game, we send you a gallery with photos from your game. Those are yours to keep as memories, or to make your new dating profile pic. Do you provide a projector, screen, and speaker? Yes, if you need it for the game, we bring it. If the venue has an A/V system, we’ll use that: if not, we bring out own. There’s no additional cost to you. Can you customize our game? Yes. We can add personalized elements that reflect your company’s mission, products, or inside jokes. We can mix and match elements from different programs. Or we can also create a fully custom program for you from the ground up. What is it like designing challenges for Survivor? No. We create games that real people play in real space. Games without screens. How physically demanding are your games? Our programs are designed to be suitable for every type of body. There are physical aspects to our games but they are not what you would call athletic. We want everyone to be able to play, because it’s not good team building if someone is on the sidelines. The exception is Amazing Race, which requires the players to travel approximately 3 miles on foot. No. Our price includes everything the team building game comprises, but nothing else: food and beverage, transportation, permit fees, etc are all in addition to our cost. No. We bring our games to you. We play in parks, on the beach, in the city streets. We’ll come to your workplace. We can come to your offsite conference center or ballroom. Some games are great in a restaurant venue, so you can play the game with a drink in one hand. Drink in both hands not recommended, but you can try. Do you do Build a Bike or trust falls? We do not. We only do games. It’s not going to be cheesy, is it? Where do you run events? Our areas of expertise are California, Las Vegas, and Austin, Texas, but with enough lead time, we can run an event just about anywhere. How much lead time do you need to produce an event? We prefer to have a contract signed 2 weeks before the event date but we’ve worked with shorter lead times. Sometimes much shorter. Once we booked an event and executed it the same day! That was a humdinger. Is working with you as great as it seems? Check out our reviews online, they tell the story.